You are here: Home / Product Reviews / Babies & Kids / AnytimeCostumes.com: Ahoy Mateys! 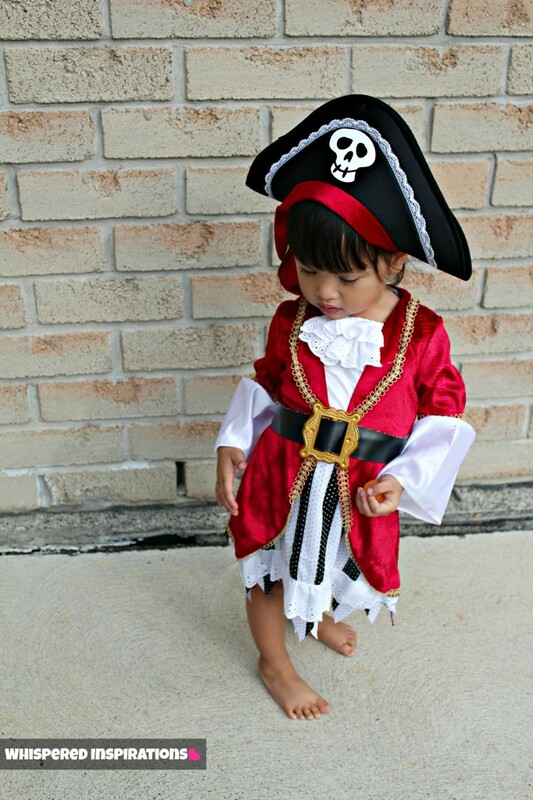 Check out this Toddler Halloween Pirate Costume! AnytimeCostumes.com is ready for Halloween! Michaela is ready for Halloween with this absolutely adorable Pirate costume, she is really in love with Jake and the Neverland Pirates and just pirates in general so this was definitely her choice when given the choice between a pirate or Minnie Mouse. AnytimeCostumes.com has Minnie Mouse too and it’s as equally adorable! She’s been playing Pirate since we got it in the mail and that just proves that it doesn’t need to be Halloween to have fun and play dress-up. It does wonders for their creativity and she sure loves squinting one eye and saying, “Arrrr”! Aye, Ordering Online is EASY! For the last few years we have ordered the girls’ costumes online and it’s super easy. What I do suggest is that you use measuring tape and find the perfect fit for your little ones or not so little ones! My Mimi is a tiny one and can still fit a smaller size and had I ordered the size for her age, it’d be too big. Same thing with Gabs, she is long and tall but, she’s slim and still fits smaller sizes. Best bet before ordering from AnytimeCostumes.com? Shiver me timbers! 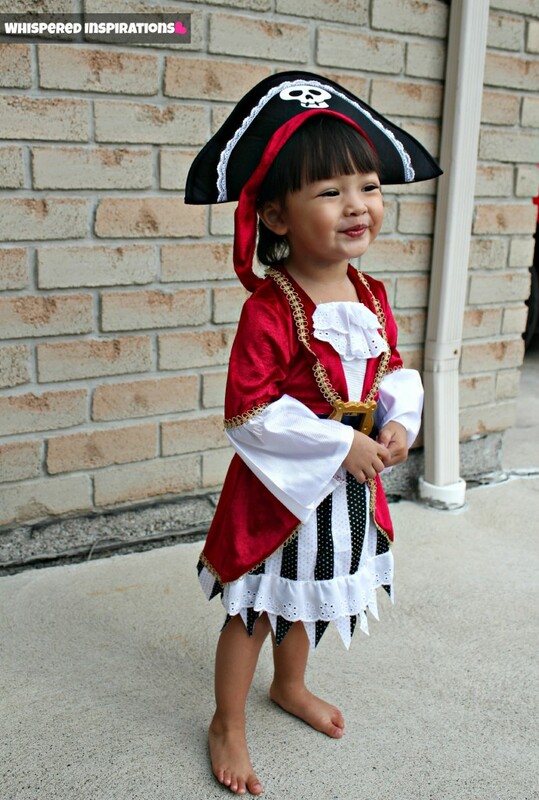 I am absolutely in love with this costume though, I am biased but–this is the cutest pirate I have ever seen! I’m pairing it with tights and a pair of boots and she will be ready to go for the chilly Halloween nights we have over here. What do I think about the costume? The costume itself is really good quality, it’s thin but not thin enough where it looks “cheap”, in fact–it’s the opposite. It’s soft, breathable and the velvet looks authentic. You can really see where the attention to detail was taken with the gold trim, the leather-like belt and gold buckle and the different textures in the skirt. The hat is light and I think one of the favorite parts of the costume for my little one. She feels like a pirate when she puts it on and I just pin it and she will be ready for a trick-or-treating soon! The prices are very competitive and affordable, this costume retails for $25.99 but, on AnytimeCostumes.com–it’s on sale for $22.09! You can find this costume and many more Halloween 2012 costumes for you and your kids at a great price for Halloween or for ANY TIME. What are you and your kids being this Halloween? Previous Post: « AngelContacts.com Review: Redefine Your Eyes with GEO Blue and GEO Gray Eyes! O.M.G that is the cutest pirate I have ever seen! simply gorg! I love the black/white/red/lace combo! Oh my that is indeed the cutest pirate ever. My little girl would love that too! Straight up adorable! That's all I have to say about that! I love how you've written your review! Your pirate is completely darling:) Halloween is coming quickly now, isn't it? Oh my goodness! ADORABLE! 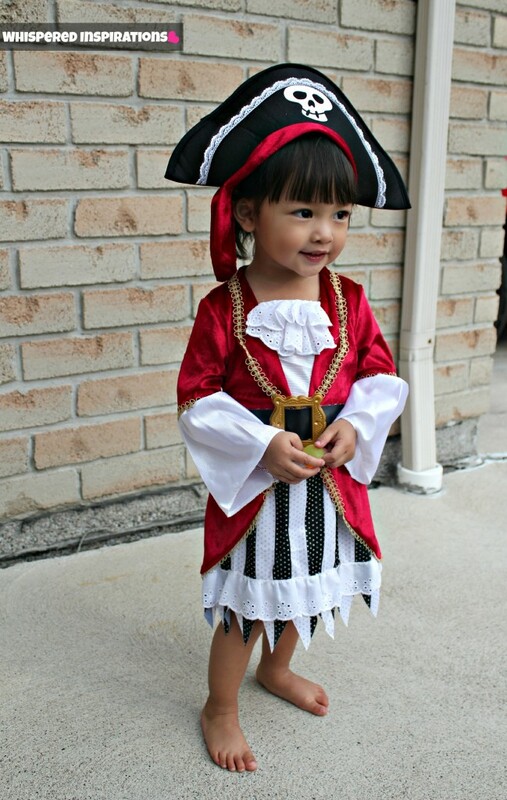 LOVE the pirate costume and so cute on her!! Seriously how cute is she?? Adorable! Love the review as we have to start thinking about this very soon! We don’t usually decide until much closer to Halloween but I think I’ll sit down with my DD this week & look through them!! That is a priceless photo! LOVE IT! Not sure what the girls will be yet this year, I better get on that! Oh my goodness, your little one is TOO adorable! Costume actually looks comfortable too, nice find! How precious!! My four year old son wants to be either a pirate with a parrot on his shoulder, a vampire or a skeleton. I know he will wait until the last minute to decide, as usual. Halloween is just the best for the little ones.